Over the years I’ve had many manuscripts offered to me, from short School Journal stories to picture books and a few novels too. It is always the most exciting (and often scary) part of my work – imagining for the first time all the different ways this manuscript could be illustrated. But there are manuscripts and then there are MANUSCRIPTS. 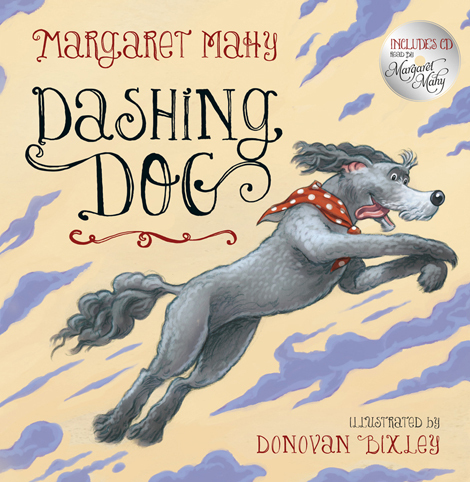 Earlier this year I illustrated Margaret Mahy’s Dashing Dog. I’d never been offered a picture book manuscript like it. Being my final blog post for the Star Author programme, I thought I’d discuss why I think Dashing Dog is so unique – and also why I made some of the decisions I made and what I was trying to achieve as an illustrator. It’s a very subtle art that Margaret Mahy practiced – one that seems deceptively simple to outsiders – and it can be a bit difficult to decribe exactly how she does what she does. Well here’s my perspective from an illustrators point of view … sometimes, when I’m given a manuscript, I feel like the author is telling me what to do. The words can seem like they’re giving me a list of instructions, like … “Kevin sat over there, in a red chair, with orange hair, with his teddy bear, did we care?” (that’s not from an actual book by the way). However, in Dashing Dog we hardly get a sense that much is going on at all – there IS a lot going on, perhaps more than in some other books, but it’s going on in a different way. When I first read the manuscript for Dashing Dog I couldn’t figure out just why I liked it so much, or what made it so different. The only thing I could come up with was that this was real poetry – not just some rhyming words. Dashing Dog was like a list of ingredients as opposed to the aforementioned list of instructions. Like all great writers, Margaret uses lovely evocative words that are great to roll around in your mouth, and like my friend Kyle Mewburn, Margaret’s words are very sparse. She was keenly aware of the fine relationship between author and illustrator, and like all great picture book authors, she leaves lots of gaps for me to fill in. Most obviously, Margaret doesn’t prescribe what kind of dog Dashing Dog is, or what colour or what size for that matter. Margaret only gives one clue as to what dog I might choose to illustrate – the word “curlicued”. 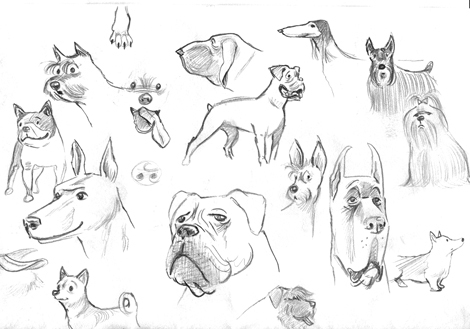 I did lots of character sketches of all kinds of curly, long haired dogs, trying to find one that would be just right for the story. Eventually I settled on a large blue/grey poodle – why? because Margaret takes our hero on a journey from la-de-da dashing to heroic dashing savior. I thought that a poodle would be the perfect dog because you could have a lot of fun visually with the contrast between a manicured poodle and the disheveled heroic dog at the end of the story. Also, Margaret’s stories always have a wonderful streak of crazy ridiculousness, and I thought that the poodle matched her fun story-telling. So I had my poodle, why make hime roan blue? I had decided early on that I didn’t want to illustrate yet another New Zealand story where I had to do page upon page of blue skies (and yet another blue sky cover to sit on the bookshelves) – instead, the tone of Dashing Dog was going to be a summery yellow. I envisioned the cover on my first reading of the manuscript – and leaping across this yellow sky would be a roan blue dog (at that stage, of undetermined breed). the cover for Dashing Dog was the first vivid picture that lodged in my brain. So here’s the funny part … after I had completed Dashing Dog I got a phone call from the mother of a boy I went to school with. She told me that her son, now living in Christchuch, owned the brother of Margaret Mahy’s dog – and this dog was … a large poodle. Black to tell the truth, but a large poodle none-the-less. So Margaret also had poodles in mind when she wrote this story. It just goes to show what a great writer she was, because she writes a story that is so obviously about a poodle without ever once mentioned the breed of the dog. I related this story to someone and they replied “Didn’t you know it was supposed to be a poodle?” – which completely misses the point – which is, the author (contrary to popular public belief) does not tell the illustrator what to do. While I was working on Dashing Dog I was also working on a book about Shakespeare. Actors love to play Hamlet because during the course of the play he portrays almost every possible human emotion. In a fun and simple way, I decided to make my Dashing Dog the canine children’s version of Hamlet. Aside from a fun story and the simple pun on ‘dashing’, Margaret takes our Dashing Dog on an emotional and character-developing journey with a subtle secondary message of not judging by appearances. 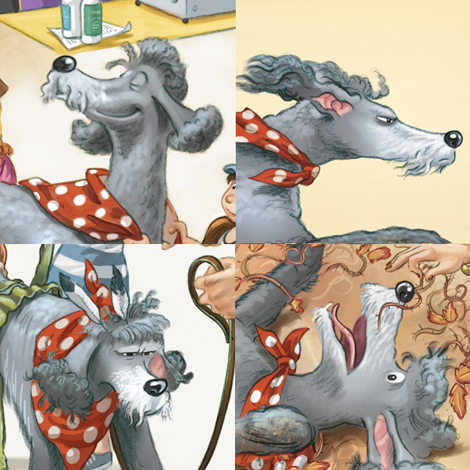 As an illustrator, it was fun to try and convey all the different doggy emotions and it became my mission to make ‘dogginess’ the focus of the story. It’s no surprise then that Margaret also doesn’t describe the environment of Dashing Dog. It’s simply a beach somewhere. The mission I give myself is to expand and fill in the spaces she leaves for me. I know there will be people out there who think that is the wrong approach – that my pictures are overdone and perhaps I should just have pictures on blank backgrounds and leave something to the reader’s imagination (someone said words to that effect somewhere). There is always a place for ‘white space’ – but here’s what I’m trying to achieve… Usually, somewhere near the start and again at the end of the book, I like to set the scene – pop in a big double page of colour and excitement that sets the tone of the story and describes the environment and the world that this book inhabits. 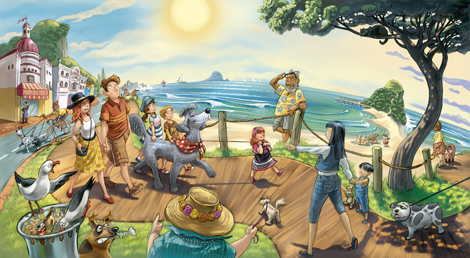 In Dashing Dog I blended all my favourite beaches: it is part Devonport boardwalk; part Napier waterfront; part Mount Maunganui; and part Whangamata (what’s the point in being an illustrator if you can’t be self-indulgent every once in a while?). My other aim with these big spreads is to expand the story beyond the pages. I want the readers to feel that this world continues outside the edges of my illustrations – that it could be a REAL fantasy world and is full of life. I have a very vivid imagination, and as a child these were the type of illustrations I liked – especially books like Graham Oakley’s Church Mice series, which are jam packed with amazing detail. Even as an adult I can pore over them for hours. So – counter-intuitively it seems – for me, more detail, not less, lets the reader’s imagination run wild. I want readers to imagine the world carries on beyond the edges of the page. Detail CAN be problematic though. I can understand the reader, or publisher, who finds detailed illustrations are a distraction from the story flow (especially in rhyming books). This is quite a fashion in American books. It’s a fine line to choose what, and how much, detail to put into a picture. Sometimes I pick up a book and feel like I’m assulted by an illustrator who has stuck in all manner of unrelated rubbish. Sometimes the detail becomes the main focus of the image may be totally distracting rather than a nice little background aside. In Dashing Dog there are all sorts of things going on in the background, but hopefully they all relate to the story – either characters and items that will appear later on, or funny in-jokes (if you look closely you might find a certain young boy wandering to the seaside with a shark fin attached to his back). In the spread above is an array of ugly dogs – which simply stand to contrast our heroic poodle. All this detail is a common trait in my work. Kids are like little sponges and if you don’t give them stuff to discover within a book, then there’s not much reason for them to go back to that book over and over (let alone the parents who might have to read it night after night). I find an entire book full of simplistic illustrations boring, and they miss out on opportunities for kids to latch on to weird little background items. In one of our Dinosaur Rescue books, author Kyle Mewburn wrote a tiny aside about Roman fire brigades. It was a great pleasure to get an email from a boy on the other side of the world who read that aside and became fascinated with Roman history. This is the type of thing I did as a kid (and still do as an adult). At the end of the day, I can’t second guess what everyone else in the world will like, I just try to do books that I would like. I have taken to heart Elizabeth Taylor’s quote “if you do it for yourself, at least ONE person will be happy”. It seems like a lot of hoohah when you write it all down, but these are all things I do instinctively. Really I’m just trying to emulate my heroes. I pick out parts of their work that I like the most and slowly form some ideas about what I’m trying to achieve. I try not to over think what I do. I know what I like. And I know what I don’t like. As Brian Eno said – “you have to be opinionated, that gives you a basis for your artistic choices”. Picture books are often children’s first experience of the written and painted arts, and in the best books, words and pictures each complement the other with what they do best. I’ve had the pleasure of illustrating some of New Zealand’s finest writers and it’s my greatest joy to be able to make a full time career out of something that I am so passionate about. I hope you’ve enjoyed reading some of my Star Author blogs about my thoughts and processes. Even if you DIDN’T – that’s great – go and form your own opinions and do something different! Arg and his brainless family are back for another adventure. Arg’s dad and the rest of the men are going out hunting and Arg is desparate to join them. Even though he’s the brainiest cave man around, his mum says he’s not old enough to join the men. Out of nowhere Arg’s dad invites him to come along on the hunt, so Arg gathers packs everything he needs into his empty mamtress and they set off on the hunt. Being smarter than everyone else, Arg doesn’t eat everything that he sees, so when all the other men become violently ill Arg has to stand guard throughout the night. When a huge Dakosaurus attacks, it’s up to Arg to save his Dad and Krrk-Krrk before they become fish food. 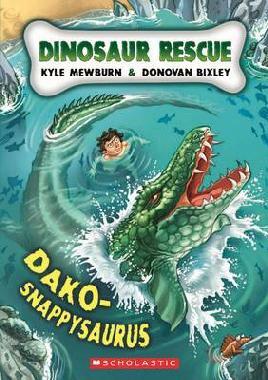 Dako-snappysaurus is the sixth disgusting and hilarious book in Kyle Mewburn and Donovan Bixley’s Dinosaur Rescue series. In this adventure you can learn about the history of time, some Stone Age weapons that didn’t catch on, some delicious Neanderthal foods, and learn about the huge crocodile that was a Dakosaurus. This book contains Donovan Bixley’s most disgusting illustrations so far in the series (beware of pages 65-67!) so they may make you feel very ill. The thing that I really love about the Dinosaur Rescue series is that you’re never really sure whether Kyle and Donovan are telling you the truth or whether their crazy imaginations have made up the information in the stories. Get your hands on Dak0-snappysaurus and the rest of the Dinosaur Rescue series at your local library these school holidays. I never really thought I “want to be a writer”. Mainly because I was always told being a writer wasn’t a “proper job”. Besides, I knew most writers never made much money, and for a long time I believed making money was very important. (Because that’s what nearly everybody said.) Writing has always been like a bloodhound on my trail. Over the years I tried all sorts of other jobs, trying to throw it off the scent, but I never quite managed it. In the end it caught up with me. Now I realise there are much more important things than making lots of money. Like doing something you love. Or bringing wild and crazy ideas to life. Getting to hang out with other writers. They are such an entertaining bunch. If I wasn’t a writer, I’d probably have to become a stalker. Or a librarian. I didn’t grow up in New Zealand, so I don’t have any all-time favourite New Zealand books. It kind of changes every year. At the moment my favourite books are Northwood by Brian Falkner (which is just such an original thrilling story) and Stomp! by Ruth Paul (because it’s delightfully simple and beautiful). I could say “that it’s next to Australia”. haha (I am, after all, originally from Brisbane.) Otherwise, I’d have to say its size. There’s so much variety packed into a small space. Two hours drive and I can be swimming in the ocean, skiing in the mountains or tramping in the wilderness. It’s unique and slightly magical. Though the flipside is you sometimes have to drive two hours to find like-minded people, too. The Phantom Tollbooth by Norton Juster. It’s deservedly a classic. My Year 7 teacher gave me his copy on the last day of school and I’ve read it every year since. If, like me, you love word games and puns, there’s no better book on the planet. It set me off on a life-long quest to write (or invent) the perfect pun. I haven’t done it yet, but boy I’ve had enormous fun trying!! Kyle Mewburn is the award-winning author of Kiss, Kiss, Yuck, Yuck, Old Hu-hu, Hill and Hole and the hilarious and disgusting Dinosaur Rescue series. 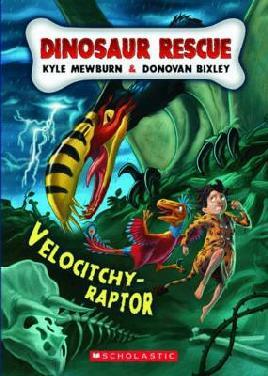 Velocitchy-raptor, book 3 in the hilarious Dinosaur Rescue series by Kyle Mewburn and Donovan Bixley, sees Arg trying to escape the clutches of a hungry Quetzalcoatlus (pronounced Kwet-zal-ca-AT-lus). Arg is trying to keep himself dry in a storm using his dried devil frog when a Quetzalcoatlus swoops down and snatches the frog, with Arg still attached. He’s taken to the dinosaur’s nest where he meets a baby velociraptor. They escape from the nest and Arg takes the baby home to hide it safely in his cave. Unfortunately Arg seems to be allergic to velociraptors and breaks out in itchy sores. If that wasn’t bad enough, his sister would have the velociraptor for dinner if she found it. Can Arg get the baby to safety? Do you like Dinosaurs? Do you like to be grossed-out by all sorts of disgusting things? If you answered yes to both of these questions then I’ve got the perfect book for you – T-Wreck-Asaurus, the first book in the hilarious new Dinosaur Rescue series by Kyle Mewburn and Donovan Bixley. Arg is a caveboy with a really big brain. He doesn’t really fit in with the rest of his tribe who are really, really stupid. Arg doesn’t know why he was born with a bigger brain than anybody else, and sometimes it can be quite lonely being this smart. Thankfully, he has his pet microceratops, Krrk-Krrk to keep him company and join him on his adventures. When an angry T-rex starts destroying his village it’s up to Arg to come up with a plan to stop him. T-Wreck-Asaurus is a gross, hilarious book and it’s perfect for fans of Andy Griffiths, Captain Underpants, and anyone who likes stories with dinosaur farts and Brontosaurus poo. The story and the illustrations had me laughing out loud. There are lots of little added extras throughout the book, including notes about Arg’s clothing, interesting facts about Brontosaurus poo and a diagram of Arg’s family cave. You may want to hold your nose as you read, because the stench from these dinosaurs is deadly! Look out for book two in the series, Stego-Snottysaurus. Come along to the Storylines Family Day in Christchurch to meet the creators of Dinosaur Rescue, Kyle Mewburn and Donovan Bixley. 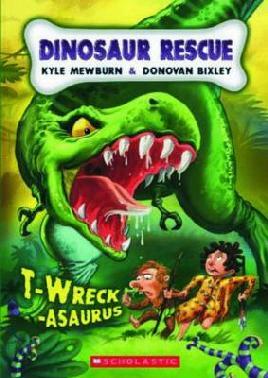 Make sure you also check out the T-Wreck-Asaurus book trailer too. Dinosaur Rescue is a hilarious new series by Kyle Mewburn and Donovan Bixley. The first two books, T-Wreck-Asaurus and Stego-Snotty-Saurus are out now and you can reserve your copy at the library. Kyle and Donovan are officially launching the series at the Christchurch Storylines Free Family Day on Sunday 21 August so make sure you come along and meet them and get your book signed. We are giving away 5 sets of the first two books right here on the blog soon so watch this space. To go into the draw to win one of these books, all you have to do is answer this question – What is your favourite dinosaur and why? Add a comment on this post with your answer, your name, and email address (so we can contact you if you win). Entries close Friday 19 August at 5pm.